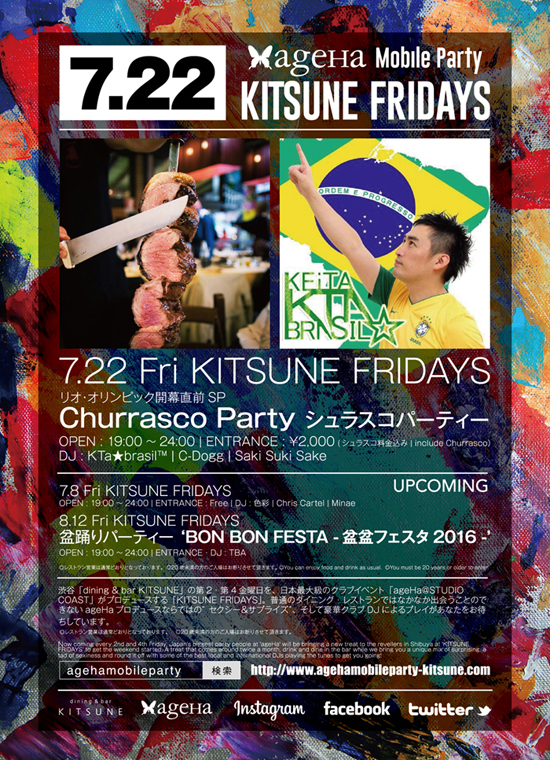 On July the 22nd, just prior to the Rio Olympics we will celebrate the liveliness of Brazilian culture with a special ‘Churrasco’ Party! Feel the passion of Brazilian music and indulge in the foods of this special culture! Born and bred in Tokyo & a speaker of Japanese, English and Portuguese. A Percussionist, MC & DJ influenced by Brazilian music who has played all over the world, showing the unique flavours of his style while always blending in seamlessly with his surroundings. An entry on Newsweek’s ‘100 Worldwide Japanese of Respect’, the subject of his own MTV Brazil special and the first foreigner to host a special for the Brazilian Football Confederation (CBF), an official presenter for the city of Rio de Janeiro as well as being one of the Brazilian Embassy’s registered artists, KTa has left his footprint in many places. Moving to Brazil alone in 1997, over the last 20 years his activities has seen him come from South America to Japan and back amongst other places. Active in the Brazilian club scene, he as has also played in Spain, Portugal, France, England, the USA, Thailand and Singapore. He has released music worldwide on such labels as BlueNote in the US, Mr. Bongo in the UK and the Italian IRMA. Multi-cultural in his performance, in addition to his skills in Latin music he is also known to incorporate Arab, African & American music into his sets. Not only is he a fixture in the club scene, he is also made his presence felt in the fashion scene (such as the Paris Collection), KTa is a well-rounded media personality with credits including MTV, Music ON! TV, Spanish NHK TV, J-Wave and Tokyo FM, as well as crossing over to the Football world, having worked as an MC for NIKE FOOTBALL and SONY FOOTBALL, he is truly a personality of many talents.